Born in Santo Domingo, in the Dominican Republic, on 22 July 1932, Oscar de la Renta traveled to Madrid when he was eighteen to study art at the Academia de San Fernando with the intention of becoming a painter. His career in fashion began when Cristóbal Balenciaga was shown some of his fashion illustrations, which led to a job sketching the collections at Eisa, Balenciaga's Madrid couture house. In 1961, eager to move to Paris, de la Renta went to work as an assistant to Antonio Castillo. Moving to New York in 1963, he was invited to design a couture collection for Elizabeth Arden. He later joined Jane Derby, Inc., as a partner in 1965 and founded his own company in 1967 to produce ready-to-wear. Also in 1967, de la Renta married Françoise de Langlade, editor-in-chief of French Vogue. Together they became part of New York's fashionable social scene, often appearing in the society columns and giving valuable publicity to the label. His clothes initially showed the influence of his time at Balenciaga and Castillo: daywear of sculptural shapes in double-faced or textured wool that were cut to stand away from the body. It was also during his time at Lanvin that he developed his talent for creating feminine, romantic evening wear, which has remained his trademark. In 1966 de la Renta became inspired by young avantgarde street fashions and produced minidresses with hotpants and embroidered caftans. However, his love of the exotic and the dramatic soon surfaced, and by the 1970s he was one of the designers to tap into the desire for ethnic fashion, inspired by the hippie movement with its appropriation of other cultures. His embroidered peasant blouses, gathered skirts, fringed shawls, and boleros became part of mainstream fashion for the rich and the leisured. When in the 1970s the midiskirt was introduced, it was received with ambivalence and Oscar de la Renta was one of the designers to resolve the hemline quandary by incorporating trousers into his collections. The prevailing attitudes to women wearing trousers became much more relaxed as he and other designers sought to give panache to what was then only associated with casualwear and informal occasions. His evening wear in many ways continued the tradition of the American "sweetheart" dress, full-skirted, with a fitted bodice and belted waist and big sleeves, very often in a paper taffeta, brocade, or chiffon, and embellished with ruffles. In January 1981 the inauguration of President Reagan reintroduced the notion of formal dressing and entertaining to Washington, D.C., replacing the southern homespun style of the previous incumbents of the White House, the Carters. Charity balls and black-tie dinners gave society every opportunity to dress up in lavish ball gowns, following the lead of the impeccably groomed Nancy Reagan. There was a new appetite for the luxurious and the ornate. Oscar de la Renta anticipated the change, remarking, "The Reagans are going to bring back the kind of style the White House should have" (Kelly, p. 259). As one of the First Lady's favorite designers, and alongside Adolfo Domínguez, James Galanos, and Bill Blass, he was favored with invitations to state dinners. It was a period when designers became part of the social scene, invited as guests to the grand occasions for which their clients required clothes. De la Renta's talents lay in designing and producing spectacular ball gowns and evening dresses, reflecting the 1980s' predilection for ostentatious display and conspicuous consumption that epitomized the Reagan years. From 1980 to 1985 the American dollar had never been stronger, and it was during this period that de la Renta was able to consolidate his business, becoming a multi-millionaire with eighty international licenses from household goods to eyewear. Television soap operas, such as Dynasty and Dallas, made universal the desire to dress up in luxurious fabrics and expensive accessories. During the 1980s de la Renta particularly favored the use of black with a single bright color, such as black and bright pink or black and emerald green, with a somewhat narrower silhouette and lavish use of embroidery, passementerie, and beading. Following the ingenue 1960s and hippie 1970s, fashion once more became about glamour for grown-ups. These classic dresses appealed to the more mature, leisured socialites, rather than the working women who were "power-dressing" in Donna Karan. 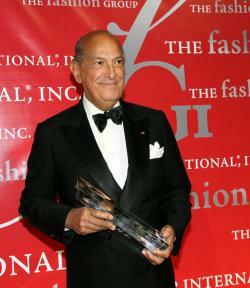 De la Renta introduced his signature perfume Oscar in 1977, for which he received the Fragrance Foundation Perennial Success Award in 1991. It was his scent Ruffles, however, in a distinctive fluted glass bottle, and produced in 1983, that reflected the ultrafeminine aspect of his clothes. 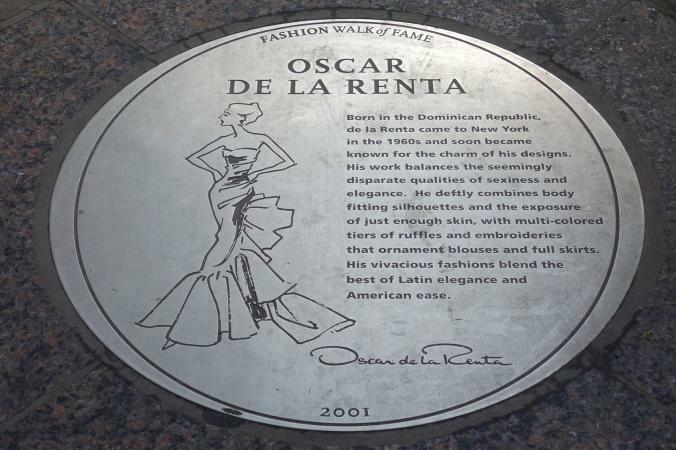 As the advertisement read, "When a woman thinks of Oscar de la Renta she thinks of Ruffles." In 2001 the designer was elected to the fashion walk of fame and honored with a commemorative plaque embedded into the sidewalk of New York's Seventh Avenue. International acknowledgment came with his appointment as designer for the French couture house Pierre Balmain in 1993, the first American designer to be recognized in this way, and a reflection of the growing status of American designers worldwide. The year 2001 saw the introduction of Oscar accessories-bags, belts, and jewelry, scarves and shoes-that reflect his passion for the ornate decoration of his native country. De la Renta has had a consistently high profile in fashion, from being the favorite designer of film star Dolores Del Rio in the early 1960s to receiving the Womenswear Designer of the Year Award from the Council of Fashion Designers of America in 2000, the honor that succeeded the Coty awards. His clothes reflect his passion for the romantic and the exotic resulting from a childhood and youth spent in the Dominican Republic and Spain. De la Renta's strength as a designer has always been his ability to combine his trademark love of the dramatic, with its roots in his Latin inheritance, with the American need for sophisticated elegance. See also Cristóbal Balenciaga; Evening Dress; Fashion Designer; First Ladies' Gowns. Coleridge, Nicholas. The Fashion Conspiracy: A Remarkable Journey through the Empires of Fashion. London: William Heinemann, 1988. Kelly, Kitty. Nancy Reagan: The Unauthorized Biography. London: Transworld Publishers, 1991.